The Dead Daisies are proud to announce the Australian release of their new album, Revolución on September 18, 2015. The Daisies will head out on tour in October to promote their brand new album, when they join rock legends and ARIA Hall of Famers, KISS on ther 40th Anniversary tour. A full list of tour dates can be found below. The Daisies are currently touring with Whitesnake in the U.S., right off the back of a huge European tour with KISS. Along the way, they have played to a pile of fans and left them in their wake with monster sets, at the largest festivals in Europe. We are currently smashing the U.S., says singer John Corabi. In October we’re heading downunder to continue the ‘Revolucion’ …. Can’t wait!” “Spring should be amazing, when we tour with our friends KISS in Australia. We’re super excited about our new album and performing to our Aussie fans! Back in February 2015, the Daisies got the chance to play some rock’n’roll in Cuba and it proved a revelation. The revelation became a revolution as the boys started conceiving their next album. 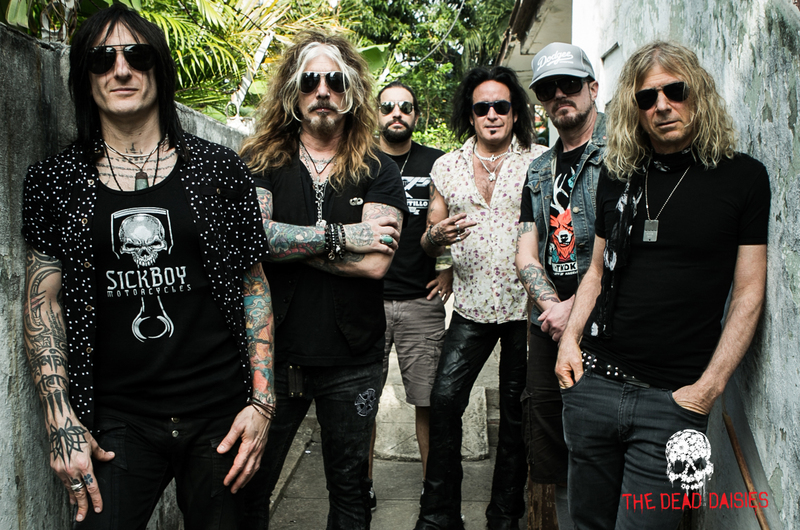 The passion they’d experienced in Cuba was confirmation – the world needs to be reminded that classic rock is alive and kicking – and with the new album, and new singer John Corabi (Mötley Crüe, RATT),The Dead Daisies were going to deliver just that, an album of classic rock Revolución! They even found time to record additional tracks for Revolución at Abdala recording studios with producer Ben Grosse (Marilyn Manson, Sevendust), who accompanied them on the journey. Revolución produced and recorded at 301 studios in Sydney with Craig Porteils (Guns N’ Roses/Billy Idol), features bassist Marco Mendoza (Thin Lizzy, Whitesnake), keyboard player Dizzy Reed (Guns N’ Roses), guitarist David Lowy (MINK, Red Phoenix), lead guitarist Richard Fortus (Guns N’ Roses, The Psychedelic Furs), John Corabi (Mötley Crüe, RATT) on vocals, Brian Tichy (Ozzy Osbourne, Billy Idol) on drums and additional drumming from Jackie Barnes (Jimmy Barnes), who is the son of Scottish born Australian singer Jimmy Barnes. Also included on the album is Cuban musician Yaimi Karell Lay on percussion. The first single from the album is “Mexico” and you can watch the Paul Boyd directed music video HERE. The track is being really well received in the U.S., Europe and now by Australian radio and has already been played on Triple M ‘Homegrown’ show along with sixteen community and digital radio stations. Also, Qantas’ ‘Rock on Q’ radio show has now added “Mexico” to the September through to November edition. Adding some spice to the release of “Mexico”, The Daisies have teamed up with Fraser Harley-Davidson Sydney, Pistonhead Lager, and Beach Burrito to bring you a ‘Secret Location’ Private show on October 11 in Sydney. There will also be the opportunity to donate and win a customised ‘Daisies’ Harley-Davidson Street 500 Motorcycle. All donations go to The Cancer Council NSW. The entire Cuban adventure has also been made into a short film and a photo e-book. Released around the album in the U.S., the documentary also premiered for the first time on Twitter on August 1, 2015. Both titled, Revolución, they were shot by photographer Katarina Benzova and Cuban videographer Karel Renzoly Green and the short film was edited by filmmaker Kenn Michael and produced by music and film producer Danny Saber. View the documentary trailer HERE. The Dead Daisies are a powerful musical collective created by a rotating line-up that features some of the world’s best rock musicians. Influenced by ’70s and early ’80s hard rock, The Daisies’ sound is soulful and accessible-equal parts The Faces, Bad Company and Foreigner: muscular vocals, bluesy riffs, big choruses, powerful melodies and strong hooks. Whether it was inspired by Elvis or The Beatles, Led Zeppelin or Jimi Hendrix, it always started with the music, and that’s what The Dead Daisies are all about. With stellar musicianship and pulverising live shows, fans across the globe are discovering the band that is bringing back Rock ‘n’ Roll! Previous postEVENT: ASIA FEST ADELAIDE 2015 LAUNCH Next postMUSIC: TRIPLE J PREMIERE BRAND NEW PARKWAY DRIVE SINGLE 'CRUSHED' ON GOOD NIGHTS TONIGHT!